Bone Daddies first venture into East London has its own a selection of dishes created exclusively for the site. 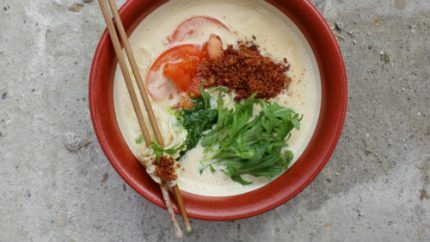 Fans of Bone Daddies will find their favourite ramen and snacks on the menu, from the flavour-packed 20-hour pork bone broth Tonkotsu, to sweet, spicy pig bones. Created exclusively for Old Street, a selection of new dishes will also be joining the classics; lovers of Bone Daddies’ inventive ramen toppings will marvel at a bowl of crispy duck aburamen with roasted sweetcorn and pickled padron peppers, a flavour combination unique to the East End outpost. A selection of Kushikatsu served with assorted sauces will also be a first for Bone Daddies. The signature Yuzu Margarita will be amongst a list of new and favourite cocktails, alongside the characteristic extensive offering of quality beers, cider, sake and wine. Bone Daddies OId Street will feature the now legendary rock ‘n’ roll soundtrack played in all of the ramen bars, bringing the full experience of Bone Daddies to East London for the first time.